i had a pretty spectacular weekend, but let’s start things off with the night that kicked it all off: friday! our friend behrle from washington, dc was coming in town for an alumni event, but we were lucky enough to get to steal her away for an evening. i met behrle a few years back when we made our annual dc in december trip and have considered her a close friend since. after a couple beers at nathan and alison’s apartment, we weaved through traffic to little five points for some dinner. 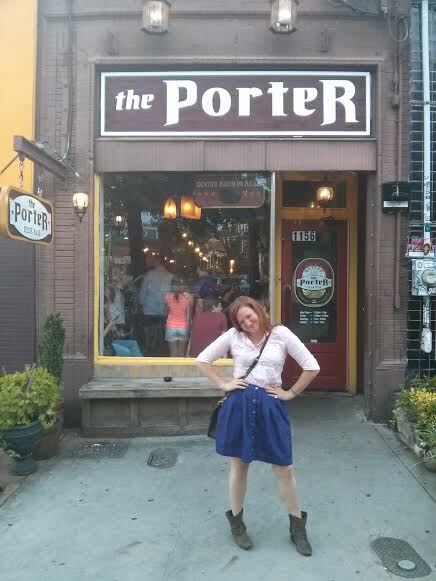 nathan swooped into a spot on euclid avenue, and we led behrle to one of our favorites: the porter beer bar. if you’ve been a loyal reader, you’ll know we first went to the porter earlier this year for new restaurant wednesday and just loved it! it’s been fun to uncover local spots where we can take visiting friends and family while they’re in town. i was worried that there would be quite a wait since it was a friday night, but i think it was early enough in the evening considering we were seated right away. the atmosphere of the porter is one of my favorite things about it, besides the excellent service, knowledgeable staff, fantastic beers, and delicious eats. hm, sounds like a spot that’s got it all! my phone editor accidentally cropped off too much of the top, but my behrle & me! since i’d begun with hefeweizen earlier that evening, it’s what i stuck with here as well. 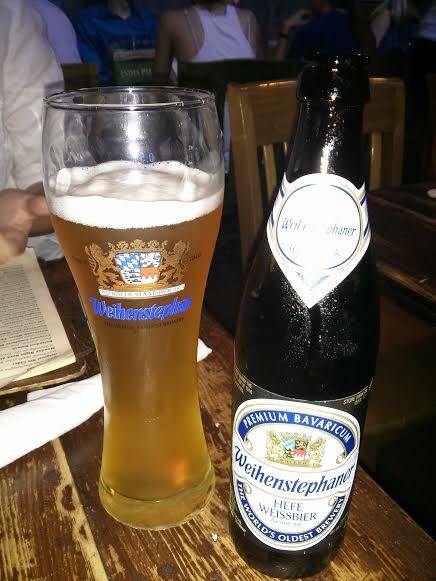 you cannot go wrong with weihenstephaner, a classic hefeweizen. i might even declare it the best! we placed our orders and caught up on anything and everything. with nathan, alison, behrle, and me, we pick right up wherever we left off last. we’re all quite invested and interested in each other’s lives, and their company, i greatly enjoy. maybe one of the reasons i love behrle so much is because she is one of the few remaining single girls out there with me. once that’s no longer true, though, i’m sure i’ll love her still! 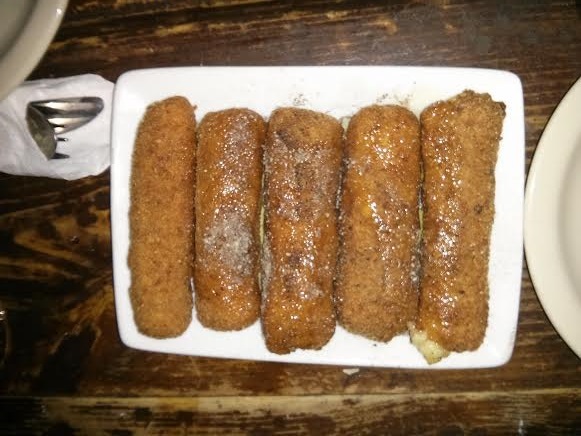 to start off our meal, we just had to order the goat cheese fritters. i remember having them our first trip here, and according to that review, we loved them! and in case you were wondering, they were just as delicious this second time, especially with that honey drizzle. behrle loved the trout sandwich (head’s up, it’s served chilled!). nathan liked his burger with the exception of the bun, simply because he doesn’t prefer focaccia bread. just like last time, alison loved the shrimp and grits but couldn’t finish the bowl because it was so rich! 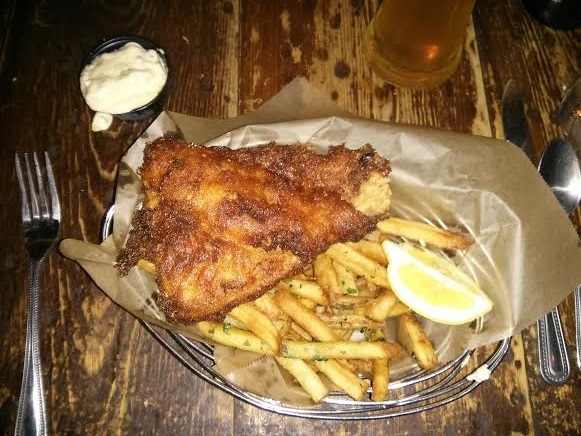 although the bratwurst and sauerkraut sounded good again, i went with the fish and chips. it was a smaller meal, which was fine by me. the single piece of fish was fried perfectly and was even more delicious with the homemade tartar sauce. once again, the porter delivers! after dinner we hustled over to 7 stages for the eight o’clock showing of dad’s garage, a local improv group. several of my friends have seen them perform, and it was a shock that i hadn’t seen them myself just yet! i love improv comedy, and it was about time i made a visit. the show was funny and original and just what i like. the dice of dynasty during the first half of the show was my favorite of the night. i just love how those folks commit to the moment! 7 stages for dad’s garage! after a couple hours of laughs, we weren’t ready to call it a night just yet. although i wasn’t ready to rage until the wee hours, i needed just a little something more before heading home. 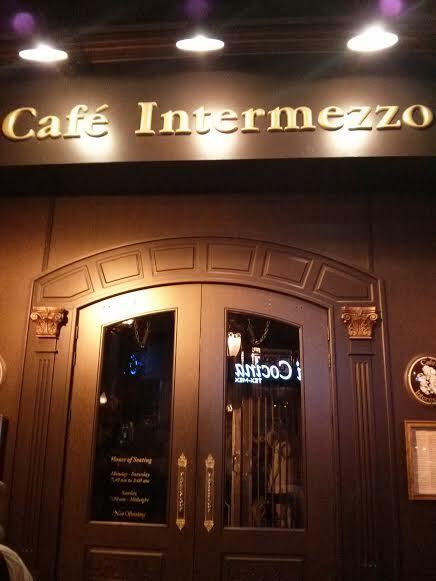 i quickly suggested hitting up café intermezzo in midtown, and everyone readily agreed. another atlanta tradition for behrle to experience! we parked at nathan’s office and walked the couple blocks down to 11th street and peachtree. eric met up with us there, and as we waited for our table we enjoyed the unusually cool and breezy evening. café intermezzo was quite busy, even so late in the night, but people watching kept us occupied for those thirty minutes. although sitting on the street would have been preferred, we settled for a couple tables inside the restaurant. 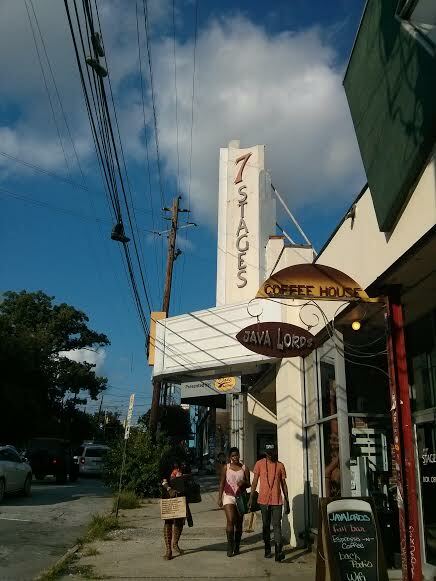 things were just as bustling inside, but our server was attentive and kind. cafes and drinks and beers were ordered all around the table, but it was the dessert cases that had us most excited. they’ve got dozens of choices of cakes and pies and cheesecakes. the options are nearly endless! it was a difficult choice, but i stuck with what i love: chocolate. the classic chocolate cake was an easy and great decision. rich and sweet and the perfect pairing with my decaf café au lait. friends and food and drinks and laughs? sounds like another successful friday night in atlanta.